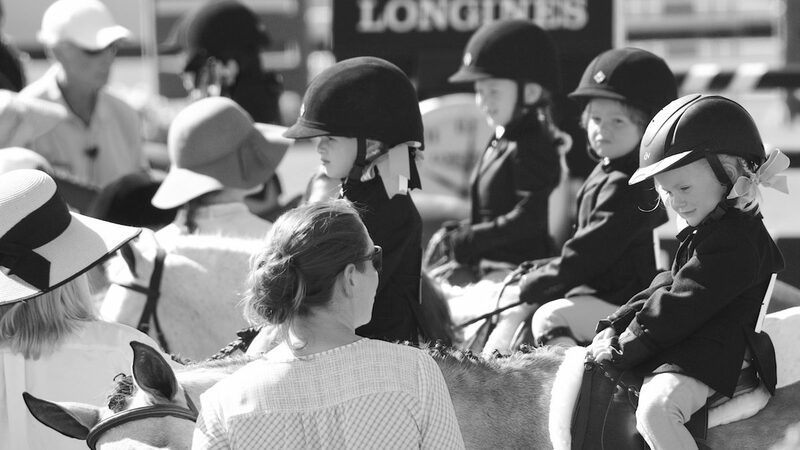 You can debate just about every aspect of equestrian sport, but one fact is indisputable: when it comes to sheer adorability, nothing competes with a leadline class. You know her best from her supporting roles in such hit TV shows as Real Housewives of Palm Beach, Ex-Housewives of Palm Beach, and Real Housewives of Palm Beach…Again, but before becoming a big time reality TV star Arianna was a leadline regular with an oversized helmet and oversized dreams. While she no longer rides competitively herself, she will be back at this year’s Hampton Classic for her daughter Olivia’s leadline debut. Her debut novel, Love in the Warm-Up Ring, will be released this December. Unfazed, she continued to chase her dream of…not having to do anything but ride nice horses, and landed her first big break at age 19 when she caught a ride on a green Dutch warmblood named Frère Jacques SPF 30. Under the watchful eye of Irish showjumping legend O’Connor O’Daniel, the pair became a force on the Grand Prix circuit and were named alternates for the US team at the 1995 Pan American Games. The good times were fleeting, however. The following year the owners of Frère Jacques SPF 30, the Coppertone Syndicate, liquidated all of its equine assets. O’Daniel left soon thereafter, citing artistic differences, and suddenly Boggs was without a Grand Prix horse and a trainer. She persevered and by the next year was racking up top five finishes with her new mare, Oops I Did It Again, and a new trainer, George H. Morris. These days you can find Angela on the Midwest hunter circuit, both as a competitor and trainer for a couple of her own leadline grads. If you happened to be in attendance that day back in 1989, you might remember the high-pitched squeals of an inconsolable redhead who had just been handed a blue ribbon. “BUT I WANT A PINK ONE!” she cried, over and over until finally another rider offered to trade. Tantrum aside, little Lulu had a mature eye for presentation and proudly did her own mane and tail braiding. After studying fashion and textiles in college, she started her own line of equestrian performance wear, but was soon forced to sell the company in order to pay off her vet bills. These days she lives outside Boston with her husband, two kids, and teaches yoga at the local Y. Little Preston made quite a splash in his Hampton Classic leadline debut—literally. It all started when his horse, Sir Mellow of Yellow, spooked during the ribbon presentation and got away from his handler, then bolted around the ring for a couple of laps and ultimately dumped poor Preston into the liverpool. Fortunately, he was ok. Though a touch rattled, he received high marks for staying on as long as he did. You’ll be happy to know the incident did not dispel his love of riding, as he’s currently the captain of the equestrian team at Foghorn Academy in the upstate. With her neurotic dad holding the line on her trusty pony You Got It Dude, then five-year-old Michelle Tanner wowed the judges with the saddle presence of a seasoned pro. Her riding career was abruptly put on hold just a couple of years later after a riding accident left her suffering from memory loss. Thankfully, it was temporary, and she returned to full cognitive function by the end of the episode. Today, Tanner is one of several leadline alums who continue to compete in the Hampton Classic. The local product was the definition of poise during her leadline days, despite the fact that her old Dutch mare, Rice Krispy Treat, was prone to biting at any judge that got too close. The granddaughter of the late Hampton Kennedy Periwinkle, founder of the color periwinkle and an avid horseman, Hammerschmidt carried on her family’s legacy throughout a decorated junior career. Now a professional, she is currently competing on the European circuit under the tutelage of Austrian Olympian Tobias von Reiter.